To mark the final year of the current-generation Rolls-Royce Phantom’s production, 50 bespoke Phantom Zeniths are being built and sold to invited buyers – such as luxury car collectors. 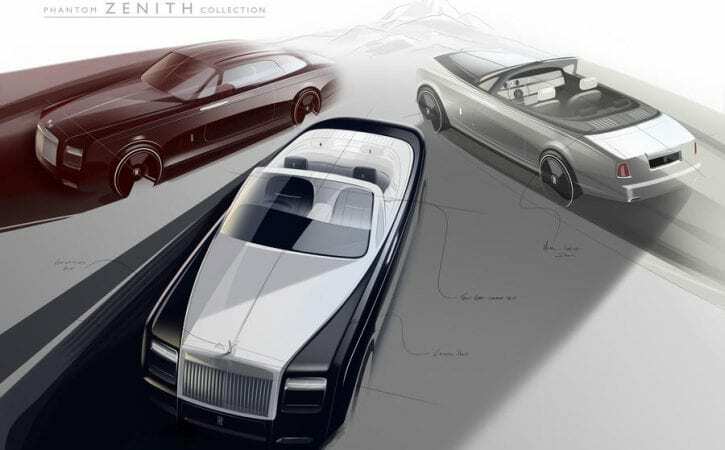 The Zenith models are available in coupé or drophead coupé form, and are being custom built to each buyer’s specifications, with a few additional features that are unique to Zenith cars. These include a new glass shelf for the rear tailgate, a larger champagne fridge – big enough to hold two bottles – and a bespoke version of Rolls-Royce’s picnic hamper. There are also badges in the cabin signifying each car’s build number, and a ‘Best English Blacking’ finish (a technique often applied to fine gun-making) on the dashboard’s surroundings. Rolls-Royce will also add a piece of metal from the soon-to-be decommissioned Phantom production line to the cars’ cabins, each with its own unique coordinates to signify where it was located in the car maker’s Goodwood factory. Other unique features include a brushed steel speedometer and front seats which are wrapped in lighter coloured leather than those in the rear. The car’s so-called ‘starlight headliner’ – a constellation of small lights across the cabin roof – also features a unique design, which illuminates the driver and front passenger with more light than those in the rear. Additionally, Zenith models are available with paint colours that hark back to Rolls-Royce’s past, such as a Madeira Red colour, which is inspired by a 1930s Phantom II. Orders have already been taken for all Phantom Zeniths. Rolls-Royce has refrained from revealing the model’s starting price, but given the low build number it will most certainly be significantly pricier than the regular coupé and drophead coupé, which cost from £338,616 and £358,488 respectively.